Update: The young man lives in Fort St. John now and not Prince George. Still good on you Ethan!! 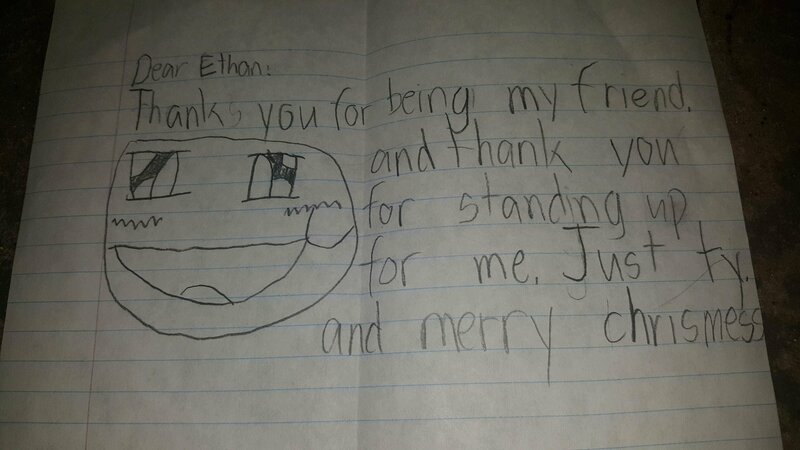 PRINCE GEORGE, BC: (Fort St. John, BC) We all know bullying at school or in the work place is something that happens every day but when a young child’s mother finds a thank you letter in their kids backpack… Makes you stop and think for a moment..
Ethan, an 8 year-old student from a Prince George Elementary school took actions against bullying and helped out a fellow student recently. Ethan’s mom asked what happened when she found the note in his backpack Saturday. Ethan explained that some kids at school were being mean and swearing at the boy. Ethan walked over and told the bullies to smarten up and get lost. The bullies stopped and Ethan asked how would they feel if someone talked to them like that. Thanks for sharing your story with us Ethan! Standing up to bullies is not an easy task for many kids! Takes a lot of courage!